The Aicon 75 Fly Motor Yacht Lutetia was designed by Italian architect Marco Mannino and built by Airon Yachts in Sicily. The Aicon 75 is a design which has been inspired by the representation of what has been called ‘the shape of movement’ and it’s the latest model released by Airon Yachts which have always been renknown for their modern and contemporary decor and futurist designs. The Aicon 75 Fly Lutetia is designed using open spaces and natural flow. On the main deck, the spacious aft dining area leads indoors to the open salon and dining room which further leads to the galley and bridge. The main salon is all framed by large panoramic windows which complete the light materials with oodles of natural light. One of the interesting features of the Aicon 75 Fly is the ‘loft’ atmosphere in the salon which allows the main deck to completely open from bow to stern. Retractable windows around the galley of the motor yacht Lutetia allow the chef to operate in an ‘open style’ kitchen or closed for extra privacy. 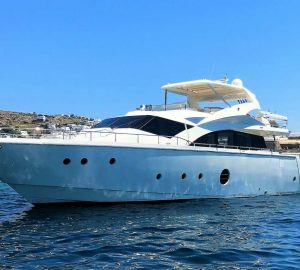 The Aicon 75 Fly Motor Yacht Lutetia offers comfortable accommodation for 8 guests. The VIP cabin is equipped with a central double bed, a large closet and a private ensuite bathroom. Two twin cabins are equipped with two individual beds, closet and direct access to a bathroom equipped with toilet, washbasin and shower. The master suite is quite impressive and is aft and full beam. This cabin has a double centre lined bed, a large bathroom and a small table and two seats that creates a small lounge by large circular windows. The Aicon 75 Fly motor yacht Lutetia also affords excellent spaces for enjoyment outside with two alfresco dining areas. The Aicon 75 Fly is powered by two 1.550 Hp CAT C32 engines to reach a maximum speed of 32 knots and a cruising speed of 28. The Aicon 75 Fly Motor Yacht Lutetia offers accommodation for 8 guests in two double cabins and two twin cabins – all with ensuite bathrooms.